Neoconservatives and other con artists are now claiming to support the Iranian people. Some are the same people who pushed to bomb Iran preemptively just a few years ago. Others, who stood on the sidelines to see who would "win," are now defenders of clean elections. It doesn't matter to the Iranian's demanding respect and self determination. For them, the real victory will be to emerge as a free nation that is outside of the "great game" of the major powers. 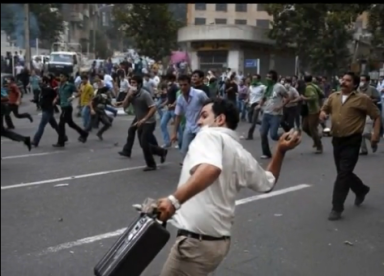 The actions of the Iranian people against the stolen election June 12, 2009 serve as an object lesson for oligarchs in nations around the world, including the United States. The people are sufficiently engaged and intelligent to notice blatant political manipulations. They're willing to take to the streets and risk their lives for the absolute right of self determination. The Iranian people know that their situation is far from hopeless. They learned that being told "there's nothing you can do" is a lie and they are demanding their rights with an adamant presence in the streets of Tehran and other cities throughout Iran. Iran's supreme leader, Ali Khamenei, spoke at Tehran University Friday to a staged crowd, one he ordered up from the countryside. He said that the election was just fine with him. That makes sense. His "guy" won in a landslide despite the clear historical trends of Iranian presidential voting over a twenty year period. This year's results were so clear to the vote counters; they were able to announce the tally in just hours. In past elections it took three days to count a similar number of ballots for the presidential elections. But the oligarchs knew the results in advance so why bother with counting? A Queen of Hea rts move was all it took. The people of Iran were disgusted with this. They did what men and women all over the world do after years of oppression. They took to the streets. But these were very mean streets.